Pre-heat oven to 350 degrees. Prepare muffin pans for 12 regular sized and 12 mini muffins by coating with olive oil spray. Zest orange and set aside. Combine the raisins in a bowl with the juice from the orange. With a mixer combine eggs, sucanant and orange zest. Beat together for 5 minutes until light and fluffy. Add the graded carrot and beat until incorporated. Add the spices, salt, baking soda, flour and ground almonds. Quickly mix until combined. Add the raisin/orange juice mixture and walnuts and mix by hand. Evenly distribute batter to muffin pans. The batter will fill each almost to the brim. Don’t worry it will not overflow when baking. Bake the regular sized for 15 minutes and mini for 10 minutes. Use a toothpick to test if they are done. If the toothpick comes out clean when inserted into the center of the cake they are done baking. Carefully remove the muffins from the pan and cool on a wire rack until completely cooled. 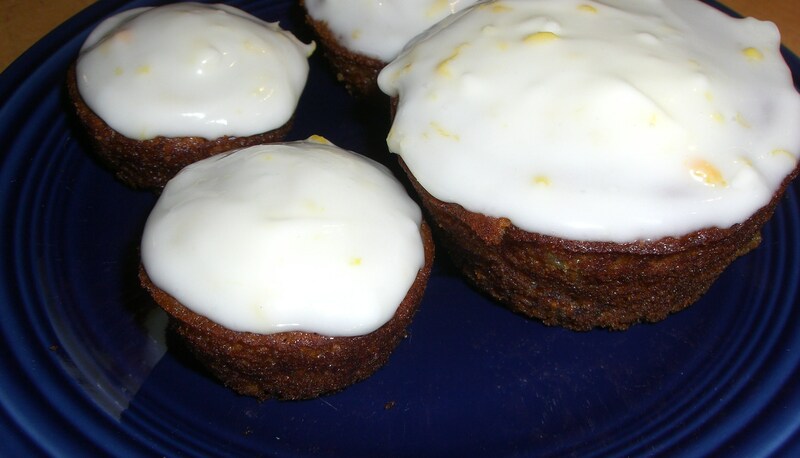 To make the frosting zest the lemon into a small bowl. Add the cream cheese and juice of 1/2 the lemon and whisk together. Add the powdered sugar and whisk until smooth. If it is too thick add more lemon juice from the other 1/2 of the lemon. If it is too runny add more powdered sugar 1 TBSP at a time. Frost all 24 cupcakes. Store cupcakes in the refrigerator.